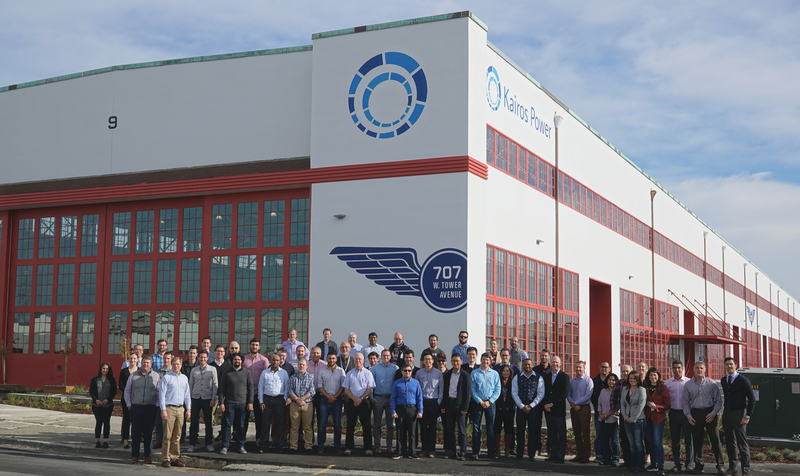 Growing from a broad research effort at U.S. universities and national laboratories, Kairos Power was founded to accelerate the development of an innovative nuclear technology that has the potential to transform the energy landscape in the United States and internationally. Kairos Power is focused on reducing technical risk through a novel approach to test iteration often lacking in the nuclear space. Our schedule is driven by the goal of a U.S. demonstration plant before 2030 and a rapid deployment thereafter. The challenge is great, but so too is the opportunity. Kairos is an ancient Greek word that relates the importance of timeliness and a call to action. Today, Kairos Power exists to accelerate innovation in nuclear power and enable affordable access to clean energy. Dr. Michael Laufer is the Co-Founder & CEO of Kairos Power. In this role, Dr. Laufer is responsible for high level strategy and operations within the company for Kairos Power’s design, development, and commercialization of the Kairos Power Fluoride-Salt-Cooled High-Temperature Reactor (KP FHR). Prior to co-founding Kairos Power, Dr. Laufer was a postdoctoral scholar at the University of California, Berkeley where his research included work in reactor safety, design, licensing, and code validation for advanced non-light water reactors. His technical expertise includes experimental and discrete-element simulation methods for granular flows relevant to pebble-bed nuclear reactors. Dr. Laufer graduated from Stanford University with a B.S. in Mechanical Engineering with Honors in International Security Studies. He received his Ph.D. in Nuclear Engineering from the University of California, Berkeley. Dr. Edward Blandford is a Co-Founder & CTO of Kairos Power. He is responsible for technology development, experimental testing, modeling and simulation, and licensing activities at Kairos Power. Prior to co-founding Kairos Power, he was at the University of New Mexico where he was an assistant professor in the Department of Nuclear Engineering. Dr. Blandford was also a Stanton Nuclear Security Fellow at the Center for International Security and Cooperation at Stanford University. He also worked for several years as a project manager at the Electric Power Research Institute focusing on steam generator thermal-hydraulics and material degradation management. Dr. Blandford has a B.S. in Mechanical Engineering from University of California, Los Angeles and a M.S. and Ph.D. in Nuclear Engineering from the University of California, Berkeley. Dr. Per Peterson is a Co-Founder & Chief Nuclear Officer of Kairos Power. Dr. Peterson also holds the William and Jean McCallum Floyd Chair in the Department of Nuclear Engineering at the University of California, Berkeley. He is an expert in topics related to high-temperature fission energy systems, safety and security of nuclear materials, and waste management. As a member of the Evaluation Methodology Group, he participated in the development of the Gen IV Roadmap while serving as co-chair for the Proliferation Resistance and Physical Protection Working Group. His research has contributed to the development of the passive safety systems used in the General Electric ESBWR and Westinghouse AP1000 reactor designs. With Charles Forsberg and Paul Pickard, in 2003, he proposed the FHR concept of a molten-salt cooled, solid fueled reactor. Dr. Peterson graduated from the University of Nevada at Reno with a B.S. in Mechanical Engineering. He holds an M.S. and Ph.D. in Mechanical Engineering from the University of California, Berkeley. Mr. Richard Meyer is the COO of Kairos Power. He leads Kairos Power’s Strategy and Innovation, Engineering Design, New Product Development, Supply Chain and Procurement, and Manufacturing Operations activities. Mr. Meyer came to Kairos Power with more than 20 years of progressive leadership experience in product development, innovation, and operations strategy across a range of industries, including defense, high-tech, cleantech / energy, automotive, and medical device equipment. His most recent position was as the VP, Engineering at L3 Technologies – Power Paragon. Prior to L3, Mr. Meyer was a Director with PwC’s PRTM Management Consulting; he held management, engineering, and operations positions at Ford Motor Company; and he served as a nuclear submarine officer in the United States Navy. He continues to serve as a Captain in the U.S. Navy Reserve. Mr. Meyer graduated with highest honors from the University of California, Berkeley with a B.S. and M.S. in Mechanical Engineering. He holds an MBA with high distinction from the University of Michigan, Ross School of Business. Mr. Peter Hastings is the VP, Regulatory Affairs & Quality at Kairos Power. He leads teams responsible for licensing and permitting activities, safety analysis and probabilistic risk assessment, and quality assurance, with a focus on establishing the regulatory basis for Kairos Power's reactor technology. He previously ran a successful management and regulatory consulting firm and held prior positions as Director of Licensing and Regulatory Affairs for Generation mPower, Licensing Manager for Duke Energy’s Nuclear Plant Development Division, and licensing and design-center lead NuStart Energy Development, LLC. Mr. Hastings’ background includes work as a reactor engineer responsible for startup testing and fuel performance monitoring, design engineer on the Monitored Retrievable Storage facility, manager in safety assurance and performance assessment for the Yucca Mountain repository, and licensing manager responsible for receipt of construction authorization for the MOX Fuel Fabrication Facility. Mr. Hastings earned his B.S. in Nuclear Engineering from North Carolina State University. He is a registered professional engineer in North and South Carolina. Mr. Richard Boukal is the Director, Supply Chain & Procurement at Kairos Power. In this role, Mr. Boukal provides supply chain and strategic leadership to the entire Kairos Power organization. Mr. Boukal has more than 40 years of procurement/supply chain progressive leadership experience in the power generation industry. Prior to Kairos, he was the Director, Global Sourcing at Mitsubishi Hitachi Power Systems Americas for 17 years. Prior to Mitsubishi Hitachi Power Systems Americas, Inc., Mr. Boukal was the Senior Procurement Manager at Alstom Power, as well as the Senior Procurement Representative at Siemens Westinghouse Power Generation. Mr. Boukal also held procurement, supply management positions at ABB Power Generation/Combustion Engineering, Inc., and Peter Kiewit Sons Construction Company. Mr. Boukal graduated from Creighton University with a degree in Marketing and received his MBA with a concentration in International Business from the University of Central Florida. Mr. Darrell Gardner is the Director, License Applications at Kairos Power. He is currently directing teams developing the licensing strategies and licensing documents for the Kairos Power Fluoride-Salt-Cooled High-Temperature Reactor (KP FHR). Previously, Mr. Gardner managed licensing document development activities associated with the NuScale and mPower small modular reactor programs. Mr. Gardner also managed licensing activities for the US EPR, where he was a 2008 Engineer of the Year, the Mixed Oxide Fuel Fabrication Facility currently under construction, and the Yucca Mountain Project Site Recommendation. Mr. Gardner has a M.S. in Engineering and a B.S. in Nuclear Engineering both from the University of Tennessee. He is a member of the American Nuclear Society (ANS) large light water reactor consensus committee. Dr. Craig Gerardi is the Director, Engineering Testing at Kairos Power. He is currently directing teams that are enabling the development of the Kairos Power Fluoride-Salt-Cooled High-Temperature Reactor (KP FHR) through rapid scaled testing and technology demonstration. Development efforts are focused on component fabrication, scaled testing, salt technology development, and supply chain for design, licensing and deployment of the KP FHR. Previously, Dr. Gerardi led the Engineering Development & Irradiation Services (EDIS) Department at Argonne National Laboratory in Chicago, IL. The EDIS Department conducted a wide range of experiments related to nuclear engineering technology including tests for reactor safety, instrumentation development and production of radioisotopes for medical applications. Dr. Gerardi obtained his Ph.D. and M.S. in Nuclear Science and Engineering from the Massachusetts Institute of Technology and his B.S. degrees in Mechanical Engineering and Nuclear Engineering from the University of Maryland, College Park. Dr. Micah Hackett is the Director, Technology Development at Kairos Power. He is currently directing teams for the development of materials and fuel for the Kairos Power Fluoride-Salt-Cooled High-Temperature Reactor (KP FHR). Development efforts are focused on technology, testing, fabrication, irradiation qualification, and supply chain for licensing and deployment of the KP FHR. Previously, Dr. Hackett managed materials development for the sodium-cooled traveling wave reactor (TWR) at TerraPower with a focus on material optimization and qualification, supply chain development, manufacturing, irradiation testing, and advanced materials development. Dr. Hackett also worked for Naval Reactors at the Knolls Atomic Power Laboratory, where he was awarded the 2009 Young Scientist of the Year Award. Dr. Hackett earned his Ph.D. at the University of Michigan in nuclear engineering in 2008. He is a member of the American Nuclear Society (ANS) and Minerals, Metals, and Materials Society (TMS). Mr. Brandon Haugh is the Director, Modeling and Simulation at Kairos Power. He is currently directing teams for the development of modeling and simulation tools for the Kairos Power Fluoride-Salt-Cooled High-Temperature Reactor (KP FHR). Development efforts are focused on system modeling, fuel performance, high temperature materials and source term modeling for licensing and deployment of the KP FHR. Previously, Mr. Haugh was Director, Innovation and Special Projects for Studsvik Scandpower Inc. with a focus on business development, licensing and deployment of LWR core design tools. Mr. Haugh also worked for NuScale Power, where he was the initial reactor physicist and helped originate the reactor analysis organization. Mr. Haugh earned his M.S. at the Oregon State University in nuclear engineering in 2002. He is a member of the American Nuclear Society (ANS). Claudio Delfino is the Director, Safety Analysis at Kairos Power. In this role, he establishes requirements, methods and executes processes for nuclear safety covering aspects of probabilistic risk assessment and radiological engineering to ensure the safe and sound operation of the Kairos Power fluoride salt-cooled, high-temperature reactor (KP-FHR). Prior to joining Kairos Power, Mr. Delfino was the Manager of Nuclear Safety Engineering at NuScale Power, where he supervised several teams in safety analysis, and provided first-line management of more than 100,000 hours of engineering work, with 25 direct reports, with deliverables that included the first safety-related release of proprietary computer code for nuclear-coupled thermal-hydraulic system analysis. Mr. Defino obtained his M.S. in Nuclear Engineering from Penn State University, and a Laurea degree in Mechanical Engineering from The University of Genoa in Italy. Mr. Gordon (Gordy) Vytlacil is the Director, Quality Assurance at Kairos Power. He is currently directing teams for the development of the quality program. Previously, Mr. Vytlacil directed QA programs for BWXT’s advanced reactors and services organizations. Advanced reactor work included Small Modular Reactors and NASA’s Nuclear Thermal Propulsion reactor for space travel. Mr. Vytlacil also worked for URS supporting reactor design projects and licensing activities and Westinghouse supporting a variety of program and project management roles related to business integration, strategy, nuclear fuels, startup, licensing, and engineering services. Mr. Vytlacil was awarded the George Westinghouse Signature Award in 1991 for his contribution to the industry Improved Technical Specification program. Mr. Vytlacil earned his B.S. at the University of Wisconsin - Madison in Nuclear Engineering and Engineering Physics with an additional major in Physics in 1989. He is a certified Lead Auditor and has been certified as a project manager, Lean/Six-Sigma Black Belt, and causal analysis lead (apparent and root).